Background Physicians can come across patients who are exposed to certain prescription drugs or toxins that can result in adverse effects and complications which have high rates of morbidity and mortality. Objective To summarise the key clinical features and management of the common movement disorder toxidromes relevant to physicians (with an interest in neurology). Methods We searched PUBMED from 1946 to 2016 for papers relating to movement toxidromes and their treatment. The findings from those studies were then summarised and are presented here. Results The key features of 6 of the common movement disorder toxidromes and their treatment are tabulated and highlighted. The management of toxidromes with the highest mortality like neuroleptic malignant syndrome and serotonin syndrome are discussed in detail. Conclusion There are several toxidromes that have the potential to become a serious life-threatening emergency if there is a delay in recognition of key clinical features and instituting the appropriate treatment at the earliest is crucial. A toxidrome or toxic syndrome can be defined as a constellation of findings that are evident either from the physical examination of the patient or from ancillary testing, which may result from drug overdose, or withdrawal or exposure to a toxin.1 Understanding of the pathophysiology of these disorders along with a high index of suspicion in the relevant clinical context is the key to recognition, for example, a patient with high fever and rigidity on antipsychotics with dopamine receptor blocking potential could be suffering from a neuroleptic malignant syndrome (NMS) while a patient with myasthenia gravis on an anticholinesterase medication such as pyridostigmine with excess salivation or perspiration can be recognised by the clinician to be experiencing a cholinergic toxidrome. This article is focused on a discussion of toxidromes relevant to general neurology and a more detailed discussion of toxidromes resulting from chemical and animal neurotoxins relevant to emergency medicine practice is beyond the scope of this article and the reader is referred elsewhere for a comprehensive account. Neurological emergencies that have at their heart an underlying toxidrome are elaborated here along with the appropriate clinical context. The description that follows is that of single agent toxidromes and multiagent toxidromes can show a combination of signs and symptoms or additional problems but are not described here1 ,2(table 1). This toxidrome is mainly characterised by hyperthermia, altered mental state, haemodynamic dysregulation, elevated serum creatine kinase and rigours. It has been associated with multisystem organ failure potentially leading to rhabdomyolysis, acute respiratory distress syndrome and disseminated intravascular coagulation.17 It can be associated with exposure to dopamine receptor blocking agents (DRBAs) (table 3) and also with the sudden withdrawal of dopamine agonists when it is referred to as neuroleptic malignant-like syndrome or the parkinson hyperpyrexia syndrome (PHS). Permanent neurological injury may occur if there is a delay in recognition or treatment. The differential diagnosis includes heatstroke, idiopathic malignant catatonia, malignant hyperthermia with inhalational anaesthetics such as halothane, CAS and serotonin syndrome (SS). Neuroleptic-induced catatonia and mild forms of NMS share parkinsonian features, catatonic symptoms and low grade fever, and have been described in patients receiving antipsychotic agents. Some consider the overlapping features as a continuum on a ‘neuroleptic toxicity spectrum’.19 Woodbury and Woodbury20 describe five stages in this spectrum from an ‘extrapyramidal reaction’ (Stage 1) to severe NMS (Stage 5) (table 5). Two different sets of criteria have been proposed for the recognition of SS in clinical settings (figure 1, table 7). Hunter serotonin toxicity criteria proposed by Dunkley (adapted from Dunkley et al ). The clinical differentiation of SS from NMS is crucial as treatments are different. There are some physical signs that can help in making this distinction (bold type in table 8), thereby aiding treatment decisions. As opposed to acute toxidromes, chronic exposure to DRBAs can cause a variety of movement disorders that develop gradually although acute toxicity can also occur in the form of sudden dystonic reactions and oculogyric crises.33 The various phenotypes of dopamine receptor blockade related tardive syndromes are described in table 1. A carefully obtained history from the patient is crucial to correctly identifying the toxidrome under consideration. However, under certain circumstances, such as when dealing with a comatose patient who has taken an overdose of SSRIs where the depressed level of consciousness is a manifestation of the toxidrome, getting a first-hand account may not be possible but information gleaned from attendants, carers and family members about medications, comorbidities and exposure to toxins can lead the clinician to the correct diagnosis. Recording the chronology of events, the tempo of development of clinical features and a detailed medication history are first steps in hypothesis generation by the clinician which can be further confirmed by a methodical clinical examination. A distinction between acute toxidromes such as NMS from exposure to dopamine receptor blockers from chronic tardive syndromes such as tardive chorea arising from exposure to the same class of drugs is as much historical as it is based on clinical examination findings. A general physical examination assessing for vital signs including temperature, skin, mucous membranes, and cardiovascular examination and abdominal examination may help provide clues. For example, a patient with fever, dry mucous membranes, tachycardia and sluggish bowel sounds on auscultation could point towards a diagnosis of an anticholinergic toxidrome if substantiated by a history of prescription of drugs with anticholinergic side effects. A focused neurological examination for the most part compliments the findings of a general physical examination and must be directed to look at pupillary responses, fundi, tone, deep tendon reflexes and gait if the patients is mobile but in most cases of significant overdose the patient's state of alertness, cognition and behaviour may not allow a detailed examination where cooperation is desired. Eliciting upper motor neuron signs in a febrile, rigid comatose patient may be crucial in distinguishing NMS from SS (table 8) when a full drug history is not accessible. Many of the clinical features described above such as mydriasis, fever, rigidity even when they are part of a constellation can be due to several medications or toxins and therefore confirmatory tests are sometimes required. For example, an awake and alert patient who presents with torticollis after an injection of metoclopramide, a dopamine receptor antagonist, can be easily recognised as an iatrogenic drug reaction. Blood and urine drug testing may be helpful in certain circumstances positively identifying the culprit drug and helping to start definitive treatment where one is available or required. However, the drawbacks of waiting for the availability of test results from a referral centre, false positives and false negatives can lead to delays in instituting treatment. Life-saving and emergency treatments in such a scenario can be empirical and necessary but clinical judgement in analysing historical data and examination findings can guide the clinician to the correct course of action. Reaching the correct diagnosis early is essential to the successful management of a life-threatening toxidrome. That NMS can be misdiagnosed as SS illustrates the perils of making an incorrect diagnosis as the management is very different. The Airway, Breathing, Circulation, Disability, Exposure (ABCDE) approach is applicable in all clinical emergencies for immediate assessment and treatment.36 Once the first three components (airway, breathing and circulation) have been assessed and secured, standard treatment follows to stabilise the deranged physiological parameters in order to preserve life and prevent harm. Not all the treatment recommendations provided here are based on evidence obtained from high quality clinical trials; where such evidence is lacking clinical judgement and consensus opinion among physicians is the next best option in what can be unchartered territory. Prompt recognition and correct identification of toxidromes is vital in managing potential emergencies in neurology practice that can have high morbidity and mortality. Prevention can be a part of the approach to dealing with these problems and some toxidromes can be avoided by a combination of education and modifications to prescribing practices. Movement disorder toxidromes can such as neuroleptic malignant syndrome (NMS) and serotonin syndrome (SS) can represent medical emergencies and a basic knowledge for recognising these conditions is essential for clinicians. Differentiating NMS from SS is important because treatments for these conditions, which can have some overlapping features, are different. Mortality and morbidity of some of these toxidromes can be high so instituting treatments, both generic and specific, in a timely manner is of paramount importance. The treatment for tardive movement disorder syndromes is suboptimal as recovery from these conditions can be delayed for months and years, and almost always never complete. Research into underlying molecular mechanisms and better treatments would be invaluable for patients. There is a lot of variation in the phenotypical manifestations and severity of patients developing movement disorder toxidromes even when exposed to similar doses of medications. The mechanisms for this heterogeneity remain largely unexplained. Preventive treatments are largely non-existent at present for most toxidromes apart from avoiding the exposure to the culprit drug but some of these drugs have important therapeutic value for treating the conditions that they are indicated and licensed for. Finding molecules and drugs that can prevent the development of certain toxidromes that can be anticipated when prescribing a particular class of drugs to patients would be useful.
. Benzodiazepine pharmacology and central nervous system-mediated effects. Ochsner J 2013;13:214–23.
. [Acute respiratory failure associated with cholinergic crisis: report of five cases and review of the literature]. Nihon Kokyuki Gakkai Zasshi 2011;49:877–84.
. Five year follow-up of artane treatment; the outcomes in 461 Parkinson cases. Trans Am Neurol Assoc 1953;3(78th Meeting):173–5; discussion, 75–7.
. High dose anticholinergic therapy in adult dystonia. The Canadian journal of neurological sciences. Le journal canadien des sciences neurologiques 1986;13:42–6.
. Neuroleptic malignant syndrome complicating levodopa withdrawal. Med J Aust 1991;155:53–4.
. Parkinsonism-hyperpyrexia syndrome due to abrupt withdrawal of amantadine. 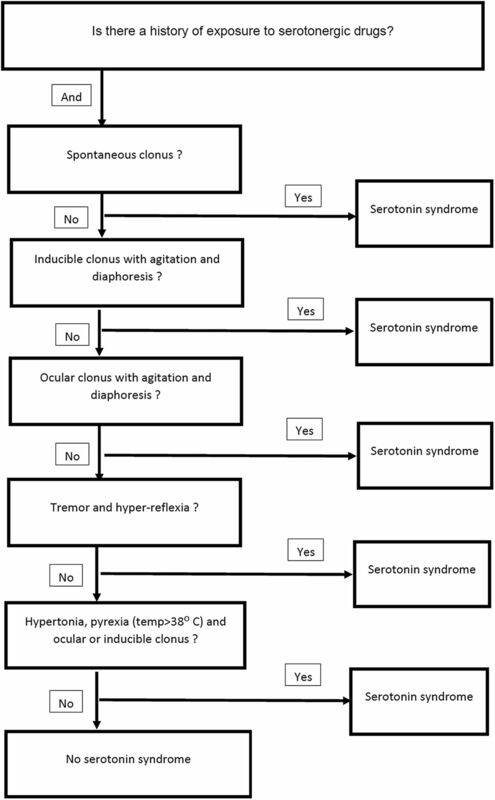 Hong Kong Med J 2011;17:167–8.
. Prevention, recognition, and management of serotonin syndrome. Am Fam Physician 2010;81:1139–42.
. Successful treatment of serotonin syndrome with chlorpromazine. Med J Aust 1996;165:345–6. Contributors Both authors contributed equally to the paper.